Is it just me, or can picking out the perfect Valentine’s Day gift be SUCH a struggle?! 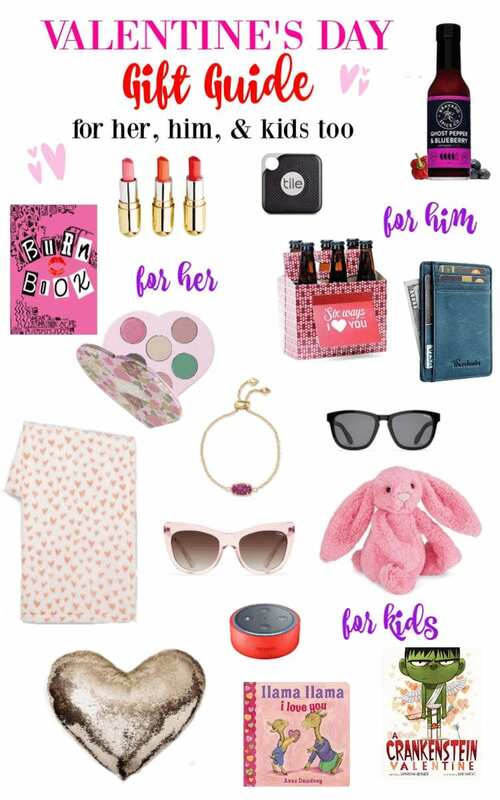 Today I’ve rounded up some cute and affordable Valentine’s Day gifts for everyone on your list–her, him, and kids/babies too–to help you out. I know it’s last minute, but the majority of these gifts will still ship in time for Valentine’s Day. I actually ordered a few of them as gifts myself this morning (sssshhhh!). Burn Book Journal (under $10): Every one I know is a fan of Mean Girls, and this is such a cute spin on the infamous Burn Book. Quay Australia Steal a Kiss Sunglasses ($30): Quay are my all-time favorite sunglasses–such good quality for the price. These clear pink frames will be too cute for spring. 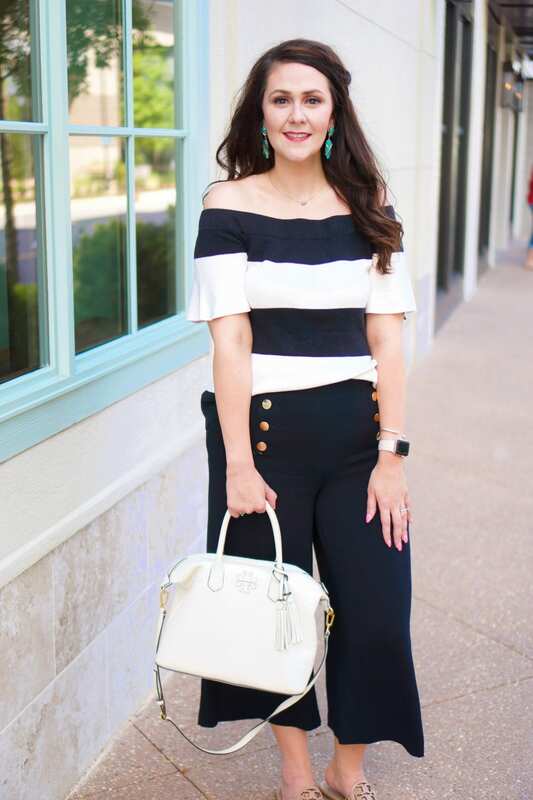 Kendra Scott Elaina Bracelet ($39.97): Kendra Scott is one of my favorite jewelry brands, and I l love their drusy pieces for every day wear. This one is on sale (reg. $65), so snag it while you can. Gold sequin heart throw pillow ($19.99): Um, what’s not to love? No, I don’t care that you don’t want it in your living room or bedroom–she’ll love it! Heart plush throw ($9.99): Skip the stuffed animal this year and get her something warm and cuddly. Add a good book for bonus points. Winky Lux Steal My Heart Lippie Kit ($30): I got one of these in a PR box a couple of weeks ago and it’s adorable! The lipstick is actually shaped like a heart. Plus, this brand is cruelty-free! Winky Lux Smitten Eyeshadow Palette ($22): This also came in the same PR box. The eyeshadow palette is in the shape of a heart! The colors are so pretty for spring, and it’s good quality too. Tile Pro ($33.99): I put this under “HIM” because men can be so hard to buy for, but honestly, it’s perfect for anyone who is always misplacing their keys!!! It connects via Bluetooth and allows you to use the app to page your keys from your phone, AND VICE VERSA! Chauncey got me one of these for Christmas and I love it! Quay Australia Hardwire Sunglasses ($30): I found these on sale for $30 or less in 3 colors. These are an update on the classic wayfayer frames. I suggest classic black. Bravado Spice Co. Ghost Pepper and Blueberry Hot Sauce ($8.49): Chauncey is a BIG fan of the Hot Ones show, where they interview celebrities as they eat wings with hot sauce, that just keeps getting hotter as they go. This hot sauce was featured on Season 3 of the show. Definitely ordered this one for Chauncey to try. . .he never thinks ANY hot sauce is hot enough. llama llama i love you (under $5): cutest board book for baby for Valentine’s Day! I love the llama llama books. A Crankenstein Valentine ($9.99 paperback): Kane just got this book in his book order at school, and it is simply the cutest! Echo Dot for Kids ($34.99): Kane loves playing around with these, and this one is specifically geared towards kids. It comes in three cool colors too! Jellycat bunny stuffed animal ($22.50): These are my favorite stuffed animals. While they come in variety of colors, this pink one is perfect for Valentine’s Day. TGIF!!! Della at Della Devoted, Becky at BYBMG, Whitney J at Polka Dotty Place, Whitney P at Come Home for Comfort, and myself want to welcome you to the High Five for Friday link-up and the weekend. We made it! High Five for Friday is where we come together to share our favorite posts we’ve written throughout the week. Drop up to 3 links below!